The year is 2021. The wind rages against the windows of my hovercraft. It is a cold wind. I don't have to feel it to know that. The line moves. I accelerate briefly, then hit the brake hard. I wait. 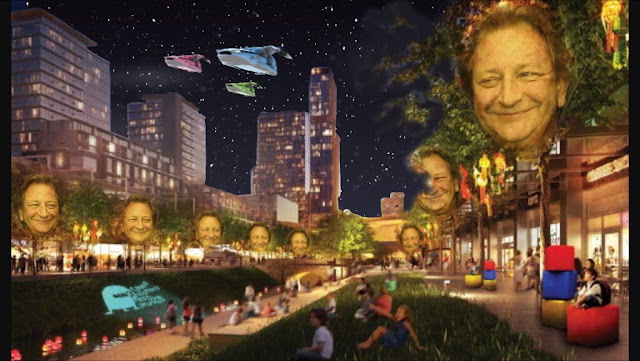 "This all used to be green fields," I say, gesturing out the window at the sprawling metropolis once known as Lebreton Flats. "Did you know that?" In the passenger seat, my son's eyes barely move from his iPhoneX. An hour passes. Finally, I pull up to the booth. "That'll be 40 credits," the attendant tells me. "40?! Last time it was 32!" "And now it's 40," he replies. "Are you going to pay, or are you going to leave?" The city never finished their light rail project. After the trade happened, workers simply walked off the job, leaving unfinished tracks and tunnels in their wake. They gave up. In some ways, I guess we all did. So now, you either park at the arena, or you risk getting caught in a radioactive snowstorm. And that's something you don't want to do. We find a spot and I power down the craft. It shudders violently, then gives a strange THUD. I sigh. That's going to cost me. We begin the long walk to the Robillard Cheering Center, where the league-worst Ottawa Senators play. "It's going to be an exciting game," I tell my son. "Lindberg and the Leafs are in town. He won the Art Ross last year. You know what that is?" I can't tell if he hasn't heard me, or if he just doesn't care to answer. He taps away on his iPhoneX like he's sending morse code. And maybe he is. Damned if I know how those things work anymore. Without warning, the sirens blare. People rush past us. A child cries. The snowstorm approaches. "We have to go. Put your phone away." He gives me one last scathing look before he finally pockets his precious device. "I wish you never would have brought me here!" There will be time for hurt feelings later. Now, we're running. Trees line the entrance to the area. On each one, the face of Eugene Melynk is projected, smirking. "Greetings, Sens Army! Just a reminder that your captain, Dion Phaneuf, will be making another $7 million credits this year! As such, expect to see increased ticket, concession, and parking prices! Come on, you know how hard it is for me to make a cyberbuck in this town! But don't fret! The minute we show some sign of being competitive again I'll definitely spend! You can trust me!" We storm past the smirking Melnyks and dive through the doors just as security rushes to bolt them shut. Some aren't as lucky. We hear them banging on the other side of the glass. We pretend we don't. I am taken aback, not by the question, but by the fact that he's speaking to me at all. "What Mr. Melnyk said. Will the Senators ever be good again?" My mind races. What should I say? Do I tell the truth, knowing Melnyk's sentries are all around, listening? Do I accept the consequences, and show him what it means to be a man? Do I even know? How could I...? I refuse to meet his gaze. "Well, son... hearing is believing."